Recently Skype has announced the new Skype 5.5 beta version for Windows which offers deeper integration with Facebook. Although Skype is already integrated with Facebook when Skype 5.0 was announced but this new release adds some more features for the users. The major feature that is added in Skype 5.5 beta release is the Facebook Instant Messaging. You can now chat with your Facebook friends directly from Skype. Earlier this features was not available in Skype. You could only call or SMS your Facebook friends. The other noticeable feature is the Facebook Contacts Tab. You can use the new Facebook contacts tab to see when a Facebook friend you want to chat with is online and then start an IM conversation right from Skype. 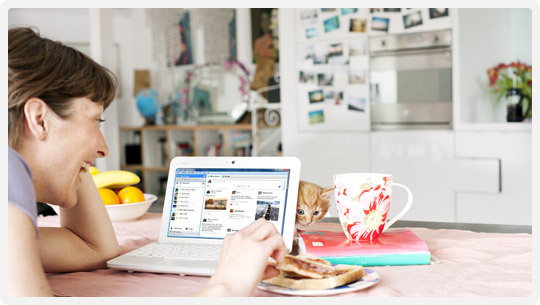 Facebook Instant Messaging – chat with your Facebook friends directly from Skype. Facebook Contacts Tab – a new tab within Skype dedicated to your Facebook contacts list. ‘Like’ and even comment on a Facebook status – You can also use the Facebook News Feed within Skype to easily “like” a friend’s status or comment on it without logging into Facebook. New Call Control Toolbar – featuring redesigned graphic icons. Improvements to the saving of a phone number in the “Call Phones” section. Visual improvements to placing a call on hold. When you download and install Skype 5.5, you will need to connect your Facebook account with Skype. When you login to you Facebook account from Facebook it will ask for your permission to access your Facebook information. After you grant the permission, it will import your Facebook contact list and you can see your Facebook friends on Skype now. Skype will show a notification each time a friend of yours come online on Facebook. You can now chat with your Facebook friends, comment on their wall, like their status updates, update your status right from Skype. Nice steps taken by Skype and this step force people to stay longer on Skype. Cool. I love these new features in Skype 5.5. Now, it will be easier and more fun to use Skype and Facebook!